any other Lean Six Sigma training provider. Six Sigma includes a set of practical methodologies that improve quality and reduce waste. 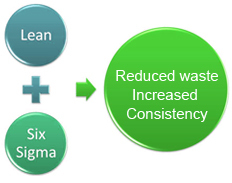 Some of the industries that use Lean Six Sigma include: healthcare, manufacturing, automotive, aviation, logistics, construction, banking, telecom, hospitality, defense, corporations, transportation, tourism, Information Technology, communications and technical services, unions, legal and financial services, retail, education, media and non-profit organisations. Businesses that implement Lean Six Sigma achieve measurable results in business processes improvement. Companies around the world use Lean Six Sigma to increase productivity, lower costs and increase customer satisfaction. Lean is a methodology that works on the principle of maximising value for customers while minimising wastage of resources. Lean focuses on eliminating expenditure on resources that do not add value to the end product/service. Organisations that use the Lean methodology continually eliminate or reduce waste in processes while enhancing the value of their end product/service. What are the Advantages of Lean? Lean companies enjoy a substantial reduction in production costs, accurate identification and resolution of defects, enhancement of the end product and increase in customer satisfaction. With Lean, companies gain a competitive edge and are better able to respond to changing customer demands. The goal of Lean is to provide maximum value to customers by creating processes with zero waste. Businesses that implement Lean are able to reduce unnecessary expenditures in processes while improving the value of the end product/service.